Date: Still 17/07/10. Just three hours at work today. Jennifer Aniston+Love Happens=Meh. I'm sick of soppy romances which practically have no point to even be in existence. Saying this makes me feel kinda sad, because even though I didn't really like this movie, it still has Aaron Eckhart in it who I really love. Burke Ryan (Aaron Eckhart) is a man who's wife died and then wrote a self-help book about overcoming grief. Ever since then he tours America doing workshops for people who need help in the same area. On one of these trips to Seattle, he bumps into hotel florist Eloise (Jennifer Aniston), who he falls for instantly. This causes Burke to admit that he hasn't really confronted the truth behind his wife's passing. Okay, so it wasn't the worst way to spend 104 minutes. Mainly because of Aaron Eckhart. But he seemed a little withdrawn from his role and his usual charisma is lacking. That probably has something to do with the fact that he knows what kind of film this is and doesn't make much of an effort to make it any better. His talents are more reserved to films like The Dark Knight, films like that he should be starring in more often. 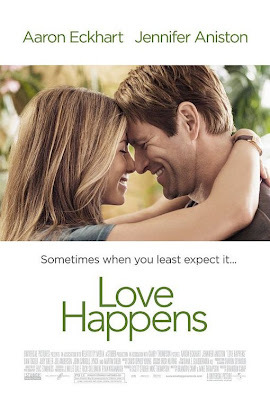 Jennifer Aniston is exactly the same in this as she is in any other film she has been in post-Friends. Will the day ever come when she stars in something that barely puts her in a romantic situation? The movie, as a whole, is kind of dull. You can see that whoever made this was trying to reinvent the rom-com by putting this story into a darker context (Burke's wife dying, the grief surrounding that). Though it has a teary end, I found myself wondering, was this movie really worth crying over? The characters weren't likeable because they were both very stereotypical and bland. And the fact that Eloise kept using huge words to make herself seem smarter just highlighted the fact that there was nothing natural about it: you could tell that the actors were forcing the script out of their mouths. Boring and shallow. But I still love Aaron Eckhart.